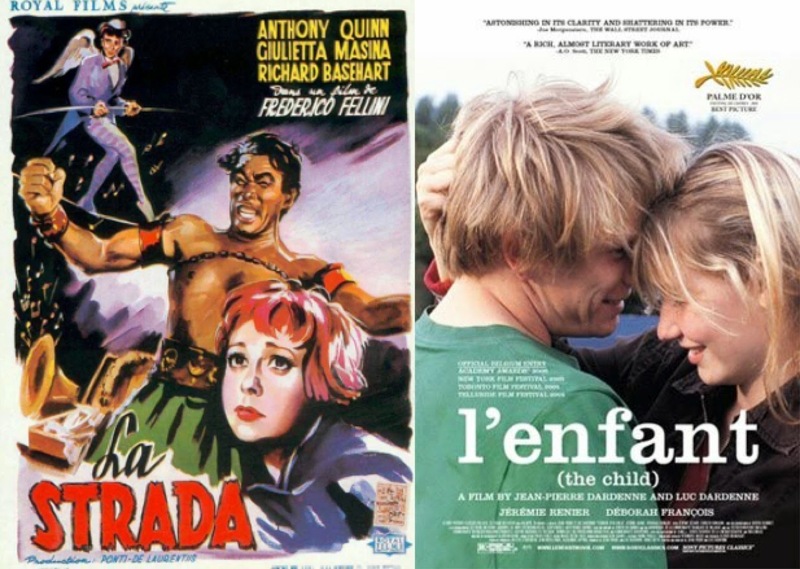 In both Federico Fellini’s La Strada (The Road) and the Dardenne Brothers’ L’Enfant (The Child), suffering is depicted as a path towards transcendence. 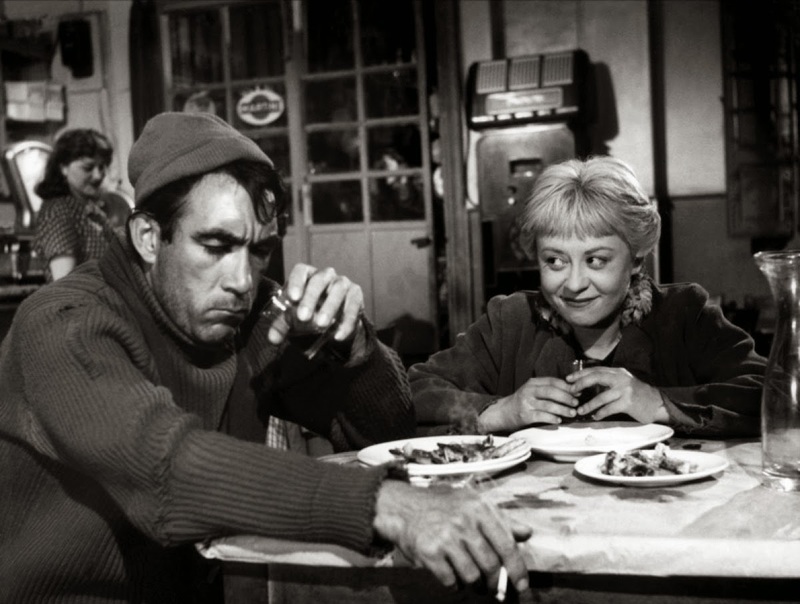 Neither of the morally complex protagonists – Zampano in La Strada and Bruno in L’Enfant – achieve true, full transcendence within the diegesis of the films – both still have long, assumedly arduous roads to walk before completely redeeming themselves or becoming spiritually fulfilled – but in both cases, the suffering they experience sets them on a path towards painful and profound realization, a moment of intense awareness that will irrevocably alter the course of their lives. For each, this suffering is reciprocal, stemming not only from the anguish of their own singular situations, but from the misery they inflict on to others. Zampano, when first we meet him, clearly leads a difficult and unfulfilling life. A travelling street performer, Zampano is relatively good at what he does – his ‘chain’ trick never fails, and he is shown to be a talented orator when playing to the crowd – but is consistently impoverished and appears to be completely bereft of family or friends. He is not a happy man, nor one who appears satisfied with his lot in life. He is often depicted scowling, or acting standoffishly, avoiding human contact and never betraying any hint of joy or excitement. This is his ‘base’ level of suffering – the day-to-day existence that fails to bring him contentment or gratification. But for Zampano, suffering arises most painfully in his relationship with Gelsomina, the young, good-natured woman whom he purchases to be his assistant. In modern psychological terms, Zampano projects his own pain on to Gelsomina, treating her poorly and sometimes abusing her, typically when he feels low or depressed about his own personal failings. Transferring his suffering to a proxy is easier than internalizing it, and Gelsomina’s cheerful, optimistic spirit is continually worn down as she is verbally and physically abused by Zampano, the grief she feels at her situation only amplifying over the course of the narrative. This is made clearest when a spiteful Zampano savagely beats ‘The Fool’ – a fellow circus performer who has repeatedly made fun of Zampano – to death. Zampano does not intend to do this, but just as he deflects his own day-to-day melancholy to Gelsomina throughout the film, he deflects his grief away rather than accepting, reflecting, and ultimately coming to terms with it. Once again, Gelsomina is the reciprocate of Zampano’s negative emotions, as she deals not only with the horror of witnessing a murder, but also begins to express the guilt Zampano should, by all rights, be feeling himself. Gelsomina is crippled by the refracted guilt she assumes, unable to move, speak, or function properly in any given setting, and repeating the phrase “the fool is hurt” over and over to herself. Gelsomina’s suffering reaches its peak as she is paralyzed by thoughts of the Fool, just as Zampano’s sins are at their utmost when he allows her to be consumed by his own mistakes. 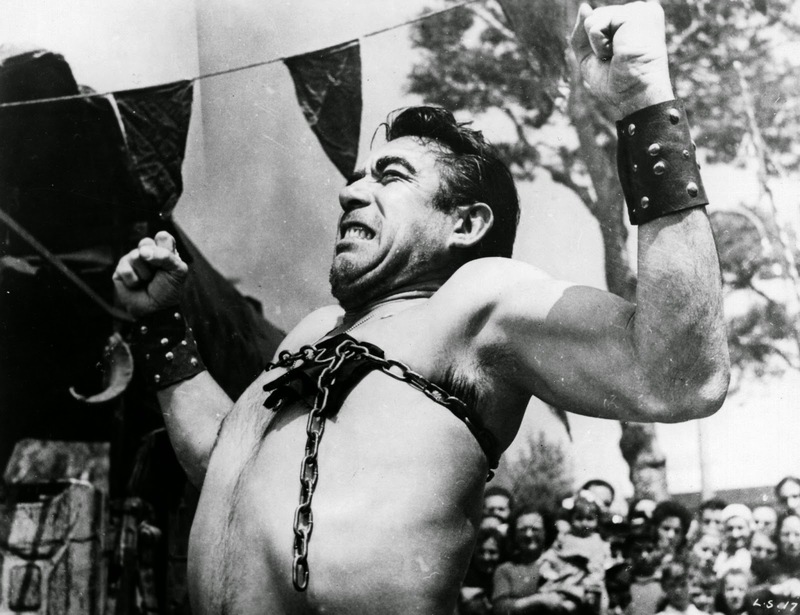 Cinematically, Fellini illustrates this by gradually changing the nature of the scenery over the course of the film. As Zampano and Gelsomina’s shared arc progresses, the action takes place in increasingly empty and expansive landscapes. By the time Zampano abandons Gelsomina on the side of the road, unable to cope with the emotional wreck she has become, the two are far from civilization, situated at the foothills of a wide mountain range as winter begins to descend. While there is a certain sense of natural beauty, the atmosphere created suggests an inescapable atmosphere of emptiness. This place is not ‘filled,’ just as Zampano has emptied himself of all negative emotions. The sparse, plain, unrefined desolation of the wintry landscape is a visual representation of what Gelsomina has become because of this, a figure of beauty and innocence inverted and ravaged by external forces. Gelsomina’s suffering continues after Zampano leaves her, as she eventually dies, sad and alone, on the beach. When Zampano – who spends the intervening time wandering emptily, a reflection of the ways in which he has purged himself of the things he should be feeling – learns of this, he begins to re-assimilate the suffering he passed on to Gelsomina. Now that she is dead, having reached the absolute apex of what emotional turmoil a human can endure, there is nowhere else for that displaced suffering to go but back to its owner. Zampano returns to the beach, and next to the ocean – constantly used throughout the film as a symbol for Gelsomina – this suffering returns to him in full, hitting his empty spirit like a powerful physical force. He is a broken man, beaten down to the sand by the very same suffering he gave unto others, and as he weeps in anguish, one senses he is now fully aware of his own moral transgressions. While calling this a moment of true transcendence is probably taking a step too far – he has not risen above anything, even if we think he may now have the capacity to do so – it is, at least, an awakening, a sensation of realization the likes of which Zampano has never before experienced. It can be said that once Zampano breaks down on the beach, his displaced pain re-internalized as part of his inner being, he is no longer capable of running from his pain, or of deflecting it on to others. By allowing himself to feel the full weight of his grief and guilt – to cry, to break down, to allow emotional to overcome him, rather than driving that emotion away – the course of his life is altered, and the search for absolution begins. The viewer does not know if or how this redemption will come, or if he can achieve real transcendence in the future, but he is set on a very different path than the one he walked before, and that is only possible because he has accepted his own suffering. In L’Enfant, protagonist Bruno follows an extremely similar arc, as many damaged characters tend to do. Like Zampano, Bruno as introduced already living in a state of suffering. A homeless thief on the streets of Belgium, Bruno appears playful and carefree on the surface, but both Jérémie Renoir’s performance and the film’s cinematography – always uneasy, handheld and fluid, hiding things from us and implying spiritual unrest in the heart of the characters – make it clear that he is in pain. How could he not be? Bruno’s life is unbalanced, difficult and stressful and extremely dangerous, for he has chosen a path of petty crime. This path is defined by selfishness and a profound lack of awareness for those around him, for just as Zampano deflected his suffering on to Gelsomina, Bruno runs from his own problems by deflecting his torment away in every possible direction. He hurts those he steals from, of course, but he is also a terrible influence on the children with whom he pilfers, and in the central plot of the film, he very nearly destroys the life of his girlfriend and newborn son. This storyline is, perhaps, the clearest instance of reciprocal suffering in either of these two films. Desperate – and probably uncomfortable with the very idea of having a child – Bruno chooses to sell baby Jimmy to the local organized crime ring, not only devastating the boy’s mother, Sonia, but creating extreme risk for the baby. Bruno’s pain has led him to make many bad decisions, but none worse than this, where his own suffering leads Sonia to one of the most fearful and emotionally intolerable circumstances imaginable. Yet Bruno continues to be oblivious, believing that the money justifies his actions and insisting that he and Sonia can “have another one.” He has deflected and created suffering, but he has yet to accept it himself, and where Zampano’s status quo remained relatively unchanged throughout La Strada, Bruno will have to experience extreme amounts of pain, distress, and discomfort before coming back around to accepting the suffering he displaced onto others. After getting the baby back and returning him to Sonia, Bruno’s circumstances begin to worsen exponentially, especially in the film’s final half. Retrieving Jimmy thrusts him into a great deal of debt, and his criminal conspirators viciously beat him when he fails to come up with the money to repay them. Sonia repeatedly denies Bruno sanctuary at her apartment, he is forced to sleep in a cardboard box by the riverbank, and a theoretically simple heist with another young thief turns into a brutal struggle for life. For all the suffering Bruno causes others, he is tormented to even greater degrees as the film moves along, a victim of his own sins and character flaws. By the end, after Sonia denies him her apartment one final time, Bruno can sink no lower, and more importantly, can no longer lie to himself. The only way to cease his suffering is to turn himself into the police, to actively seek out absolution in the hopes that his situation may improve. This stands in contrast to Zampano, who is rather unwittingly made aware of the suffering he displaced. Bruno does gain awareness of his guilt, and acts upon it at a critical juncture, but the moment of ‘transcendence’ is still left until a climactic confrontation with the person he hurt most – Sonia. She visits him in prison, and seeing her once again seems to trigger something in Bruno, a profound sense of grief, guilt, and anguish, nor just for what he has gone through, but for the trials he inflicted on this good and innocent person. Like Zampano, Bruno’s suffering becomes circular, coming back to its point of origin in his own tortured soul. Once it has returned, there is nothing Bruno can do but break down, and while we are once again unaware whether or not this moment of realization will lead Bruno to redemption, it is still clear his path through life has shifted. This notion of circular, reciprocal suffering is crucial to the arcs of both characters and both films, and is key not only to Fellini’s and the Dardenne Brothers’ view of transcendence, but to the arcs of many films dealing with deeply damaged, destructive characters. More than simply becoming aware of the larger truths one has shied away from, Zampano, Bruno, and characters like them transcend themselves through a sudden and excruciating influx of emotions, feelings that stem from their own splintered spirits. Though such suffering is incredibly difficult to internalize or process, re-accepting them is critical, for only by acknowledging the entirety of who we are – rather than deflecting the pieces we would prefer to ignore – can we be whole, and only by being whole do we have a shot at transcendence.